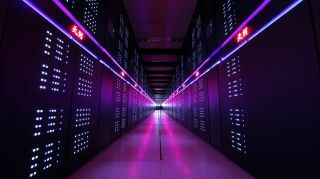 The Chinese supercomputer Tianhe-2, the second fastest in the world, successfully tested processing software that will help analyze data from the gargantuan Square Kilometer Array telescope. This future giant telescope has got brains! A proto-version of the Square Kilometer Array's software system worked well when tested on the world's second-fastest supercomputer, International Centre for Radio Astronomy Research representatives (ICRAR) said. The Square Kilometer Array (SKA) is a multi-antenna radio telescope expected to be built in 2018 in parts of South Africa and Australia. Once it is operational in 2020, the instrument will effectively be "the world's largest science project," its ICRAR builders have said. The SKA telescope's software will turn the raw observations of stars and galaxies into data that astronomers can analyze. "Each of the two SKA telescopes will produce enough data to fill a typical laptop hard drive every second," ICRAR said in a statement. The test was co-led by Andreas Wicenec, head of data intensive astronomy at ICRAR, and Tao An, from the Shanghai Astronomical Observatory in China. Getting SKA's data analyzed will be a computer-intensive process, considering that the low-frequency part of the telescope alone has more than 250,000 antennas, officials said. So tests are being run on China's Tianhe-2 supercomputer, which was the fastest computer in the world until June. An artist's illustration of the low-frequency radio antennas to be built in Australia as part of the Square Kilometer Array radio telescope project. The prototype software, called the SKA Science Data Processor, was first run on 500 computing nodes of the supercomputer, then 1,000 nodes. (In this case, a "node" refers to individual computers in a cluster.) The long-term aim is to handle up to 60 million data items across at least 8,500 nodes of the supercomputer. To help with the huge volume of data, the processor has a novel feature to make the processing go faster. The framework is "data-activated," meaning that individual bits of data are linked to software that can automatically start the applications necessary to process them. This means that data is processed immediately, allowing new tasks to be triggered instead of waiting idle. When completed, SKA is expected to spread across at least 1,864 miles (3,000 kilometers) in Australia and South Africa. The telescope's work is expected to improve scientists' understanding of how the universe — and the laws of fundamental physics — behave.